The How To Guide - Journey Book Set is the companion How To Guide for adult volunteers. It provides key information about the journey, its awards and its leadership benefits, and step-by-step sample plans for how journey sessions can unfold as girls come together and meet. The adult guide also features sections on Girl Scout history as well as an understanding of girls at each grade level. Each "How To Guide" / Journey Book Set has everything adult volunteers need to enjoy this amazing journey just as much as their troop. All that's needed is your enthusiasm and sense of adventure. The How To Guide and Welcome to the Daisy Flower Garden Girl's Book Set includes a Garden poster. In this journey for kindergarteners and first-graders, a favorite pastime—gardening—meets the Girl Scout Law. The result is a storybook world of flowers and little girls who, together, do great things. Girl Scout Daisies will especially enjoy meeting the colorful, global characters who teach them to live the Girl Scout Law. 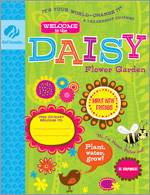 The adult "how-to" guide offers Garden Story Time tips, key ideas for garden projects, and all the Girl Scout history and traditions needed for an adventure starring Amazing Daisy, a new flower friend for Girl Scout Daisies. Have you heard the newest Girl Scout Daisy song? All printed versions of the song are to include the following: © Girl Scouts of the USA, Words and Music by Sandy Thomas, Vocals by Melinda Caroll, Recorded by Legend Productions. Like all Girl Scout journeys, ''Welcome to the Daisy Flower Garden'' focuses on the leadership philosophy of girls discovering (themselves and their values), connecting (caring and teaming), and taking action (to improve their communities and the world). For Girl Scout Daisies, the best way to experience this leadership philosophy is by practicing the Girl Scout Law. So the journey's three awards, which tie directly to the garden theme, recognize girls' progress in applying the Law to their lives. Why not start out your year by giving the girls the background "Garden Patch" to display their three Girl Scout Daisy awards? The Watering Can Award represents girls being "responsible for what I say and do." Girls earn the award by caring for their mini-garden and beginning to understand how the Promise and Law play out in their daily lives. The Golden Honey Bee Award represents taking action through a gardening effort for others to make the world a better place. The award is named for Honey, the bee who is one of the Daisy Flower Garden characters. The Amazing Daisy Award represents knowing—and living—the Promise and Law, just like Amazing Daisy, the main character of the journey.